Reproductive Biology Laboratory, Department of Zoology, Gulbarga University, India. SUMMARY: Calotes versicolor, collected during peak breeding and nonbreeding season were used for the study of anatomy and histophysiology of pituitary gland. In C. versicolor the pituitary gland is small compact mass attached to the hypothalamus by a delicate stalk. It is of two basic units, adenohypophysis and neurohypophysis. The adenohypophysis includes pars distalis (PD) and pars intermedia (PI). The pars tuberalis (PT) which is usually reduced in reptiles, is absent in C. versicolor. The neurohypophysis is composed of median eminence (MI) and neural lobe or pars nervosa (PN). 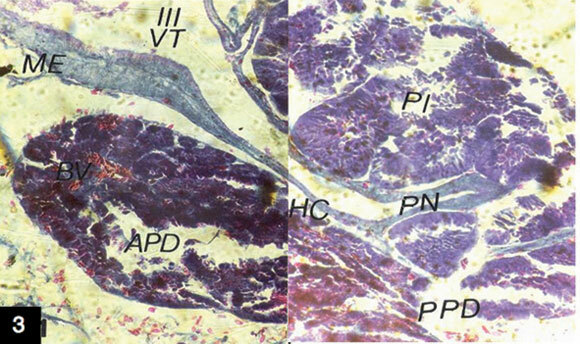 The anterior PD is rich acidophils than the posterior PD during breeding season. These cells are differentiated as A1 and A2 cells. The A1 cells are erythrosinophilic and stained purple or red and A2 cells stained yellow with orange G. The identified A1 cells are regarded as lactophores and A2 cells are regarded as somatotropes. The secretion of these cells and cell number is reduced during nonbreeding season. 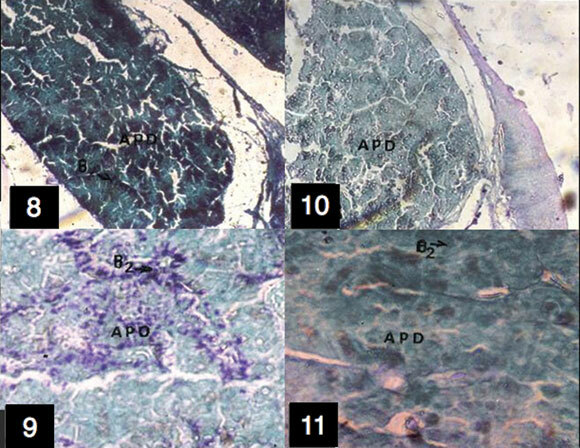 The basophils of PD are PAS +, AF + and aniline blue + during breeding season. These cells are classified as B1 and B2 cells depending on their size and location. The large B2 cells are present in cords and B1 cells are located closely to these parts. The B1 and B2 cells are regarded as thyrotrophs and gonadotrophs respectively. During nonbreeding these cells show negative response to the above stain. The PI is large and labulated. The cells are AF+, erythrosine and secrete highly granular material during breeding season. During nonbreeding season they become AF-, erythrosine- and less secretory. The secretion present in neurosecretory cells of the neural lobe appears as large granules and they are AF+. These cells take deep blue stain indicating rich neurosecretory material during both breeding and nonbreeding season. The median eminence (MI) is located at the anterior part of neurohypophysis and sends portal capillaries to adenohypophysis. KEY WORDS: Calotes versicolor; Pituitary; Pars distalis; Pars intermedia; Pars tuberalis. RESUMEN: Calotes versicolor, recolectadoss durante el peak de la temporada no reproductiva y la reproductiva fueron utilizados para el estudio de la anatomía e histofisiología de la glándula pituitaria. En C. versicolor la glándula pituitaria es una masa compacta y pequeña unida al hipotálamo por un tallo delgado. Se trata de dos unidades básicas, adenohipófisis y neurohipófisis. La adenohipófisis incluye la pars distalis (PD) y la pars intermedia (PI). La pars tuberalis (PT), usualmente reducida en reptiles, está ausente en C. versicolor. La neurohipófisis está compuesta por una eminencia media (EM) y el lóbulo neural o pars nerviosa (PN). La PD anterior es más rica en acidófilos que la PD posterior durante la temporada de reproducción. Estas células se diferencian como células A1 y A2. Las células A1 son eritrosinofílicas y se tiñen de color púrpura o rojo y A2 son teñidas de amarillo con anaranjado G. Las células identificadas A1 se consideran lactóforas y las células A2 se consideran somatotropas. La secreción de estas células y el número de células se reduce durante la temporada no reproductiva. Las basófilas de la PD son PAS+, AF+ y azul anilina + durante la temporada de cría. Estas células se clasifican como las células B1 y B2 en función de su tamaño y ubicación. Las grandes células B2 están presentes en cordones y B1 se encuentran localizadas cerca de estas partes. Las células B2 y B1 se consideran tirotrofos y gonadotrofos respectivamente. Durante la temporada no reproductiva de estas células muestran una respuesta negativa a la tinción anterior. La PI es grande y labulada. Las células son AF+, eritrosina+ y secretan material altamente granular, durante la temporada de cría. Durante la temporada no reproductiva se convierten en AF-, eritrosina- y de menos secreción. La secresión presente en las células neurosecretoras del lóbulo neural aparece en forma de gránulos grandes y es AF+. Estas células toman una profunda tinción azul indicando el rico material neurosecretor durante las temporadas de cria y la no reproductiva. La eminencia media (EM) se encuentra en la parte anterior de la neurohipófisis y envía capilares portales hacia la adenohipófisis. PALABRAS CLAVE: Calotes versicolor; Pituitaria; Pars distalis; Pars intermedia; Pars tuberalis. The pituitary gland being the principle gland of internal secretion is the most complex organ of endocrine nature. It occurs throughout the vertebrates, in cyclostomes, fish, amphibians, reptiles, birds and mammals. In all of the vertebrate classes the gland shows remarkable similarities in its overall morphology; but it is structurally highly specialized and there are considerable differences between the different classes and even between closely related species. The change in the functional cytology of the pituitary is to correlate the microscopic appearance of the gland with different phases of cyclical activities controlled by pituitary. The reproductive cycles, determined by the cyclical release of gonadotrophins from the pituitary are accompanied by cytological changes in |e cells secreting "these hormones. In seasonally breeding species the changes are extended over much greater periods of time. In the vole for Sample, Clarke & Forsyth (1964) found that during breeding season cells were filled with numerous PAS positive granules but in the nonbreeding (winter) season PAS positive material was present only in the walls of large intercellular vesicles. Assays showed a high content of gonadotrophin in the glands of males during the breeding season, but not in winter. Such observations provide suggestive if not conclusive evidence that the granular of PAS positive cells are gonadotrophs. Similar cytological changes occur in the pituitary of the ferret (Holmes, 1963). Increase in PAS positive cells in a hibernator, the ground squirrel was correlated with increased gonadal and thyroid activity by Hoffman & Zarrow (1958). Seasonal studies on the hypothalamo-hypophysial complex in teleost fishes have clearly indicated the possible role of hypothalamic neurosecretion in regulating the function of gonads (Stahl & Heray, 1962; Dutt & Govindan, 1967). Pituitary transplants in fishes (Batten et al., 1983), amphibians (reviews: Jorgensen, 1968; Dodd et al., 1971) and the wild mouse (Madhyastha & Gopal, 1978) have revealed regression of the gonadotrophs and decrease in gonadotrophin secretion thereby suggesting the importance of hypothalamic control of the gonadotrophs. As opposed to other vertebrates, the reptilian hypothalamus has not been clearly understood, but the available evidence points to a stimulatory hypothalamic control of gonadotrophin secretion (Holmes & Ball, 1974). The reptilian pituitary gland gains importance because of its phylogenetic position as it resembles quite strongly the amphibian pituitary on the one hand and the avian pituitary on the other. The primitive condition is thought to be that in sphenodon, turtles and crocodiles, with a well developed pars intermedia and pars tuberalis and pars distalis which is fairly distinctly divided into anterior and posterior lobe. In the lizards pars tuberalis is reduced or absent and never developed in snakes. Saint Girons (1970) has given detailed accounts of pituitary structure and histology in reptiles. Eyeson (1970) has reported experimental studies of the gland in the lizard Agama. The pars distalis consists of irregular branching cords of endocrine cells, always narrow and often only two cells thick interspersed with plentiful capillary network. In chelonians the cells are arranged in pseudo-acini (Saint Girons, 1970), sometimes containing colloids (Wingstrand, 1966). The division of the pars distalis into cephalic and caudal lobes is usually well marked, often by a transverse constriction in addition to a differential distribution of cell types (Saint Girons, 1970; Forbes, 1971). Generally six chromophilic cell types can be identified in the pars distalis by their tinctorial properties. Apart from chormophils, chromophbic cells occur in varying proportions, from rare as seen in agamid lizard to abundant as seen in lacertid and iguanid lizards (Saint Girons, 1970). On the basis of morphology, distribution and tinctorial affinity of five types of granular chromophilic cells, four types of mucoidcells (B1 to B2) and two types of acidophils (A1 to A2) were distinguished in pars distalis. The acidophilic cells of pars distalis exhibit distinct regional localization. However, the studies are still lacking in giving complete information about the distribution. As the reptilian fauna of India is much rich and varied, more remains to be done on the pituitary. There is a scanty of information on the pituitary of common garden lizard C. versicolor. However, Nayar & Pandalai (1963) have reported the secretory nature of chromophilic cells of intermedia. Mohanty & Naik (1979) have reported presence of prolactin secreting cells in pars distalis. As C. versicolor is a seasonal breeder shows cyclical changes in the reproductive activities, it is of interest to study the secretory pattern of pituitary cell types accompanied by cyctological changes in its secretary nature. Calotes versicolor were collected during peak breeding (May and June) and nonbreeding (December and January) seasons. These animals were acclimatized to the laboratory conditions for about a week. The animals weighing 40-50g with snout-vent length of 14-15 cms were selected for the study. They were fed regularly with live cockroaches and water ad libitum. During both breeding and nonbreeding seasons selected forty animals were sacrificed by decapitation. The heads were collected and crania were dissected out along with brain. The roof and sides of crania around the brain was slightly exposed and then they were fixed in Bouin's fluid, as it is not possible to retain the pituitary along with brain without cranium. The crania were retained in the fixative for 30 days for decalcification. After removing the cranium, the brain with intact pituitary was transferred to fresh Bouin's fluid for 24 hours. The portion of the brain along with the pituitary was .taken out for further processing. Care was taken to retain the pituitary intact along with its stalk which is connected to hypothalamus while taking out, as the pituitary of C. versicolor is connected to the hypothalamus with this delicate stalk. Then they were transferred to 70% alcohol for 24 hours and given several changes with fresh alcohol. The tissues were processed for dehydration by passing through alcohol grades and cleared in toluene. They were embedded in paraffin and sectioned at 6µ thickness for cytological studies. Histochemical methods used for cytological studies. In adenohypophysis, the secretory granules have the affinity towards both basic and acidic stains and it is largely on their staining property the differentiation and classification of various cell types has been made. The granules contain the hormones of the gland probably associated with some kind of carrier substance. Various histochemical techniques have been evolved to study the pituitary cell types. The following standard methods have been applied to identify the cell types and their secretory nature. Aldehyde Fuchsin (AF) (Gomori, 1950) proceeded by acid permanganate oxidation, using fast green chromotropes 2R as the counter stain. Cleveland & Wolfe's trichrome method (1932) used as differential stain for the cell types of adenohypophysis. The three stains used in this method are aniline blue, erythrosine and orange G.
Aldehyde thionine (ATh) periodic acid Schiff (PAS) Orange G (OG) procedure of Ezrin & Murray (Dood & Kerr, 1963). The PAS reaction will stain polysaccharides, mucopolysaccharides, mucoproteins and glycoproteins (Pearse, 1968). Before going for the detailed cytological study of pituitary gland, camera lucida diagram of whole pituitary gland was taken in X100. Camera Lucida diagrams. The camera lucida was fitted in the microscope. The slide bearing the section of entire pituitary gland was focused, viewing through the prism of the camera lucida. Artificial light source was used for focusing and other lights of the room were kept dim and far away. The distance of the light source was so adjusted that the light was neither bright nor too dim. Then the white paper was kept on the right hand side of the microscope on the table and sharp pencil was held in right hand. Attempt was made to visualize clearly the object on the microscope by looking into the eye piece of microscope. Once the object, as well as paper and the pencil point were clearly focused, the outline and detailed anatomical structure of the pituitary was made. While looking through the microscope, it appeared that the pencil point was actually moving on the object, while in reality the image of the object was being reflected on the paper. Then the sketch was made permanent using India ink (Figs. 1 and 2). Fig. 1. Camera lucida diagram of mid-sagittal section of the pituitary gland Calotes versicolor to show the distribution of cell types of pars distalis and pars intermedia during breeding season X 100. A. Mid-sagittal section of the pituitary gland of C.versicolor showing various parts. B. Distribution of cell types in pars distalis (open circles, acidophils 1(A1), erythrosine positive) and pars intermedia (closed circles, acidophils 2(A2), orange G positive). C. Distribution of cell types in pars distalis: Anterior to posterior i.e., half shaded circles (basophils 1 (B1), aniline blue positive) and crossed circles (basophils 2 (B2), aniline blue positive). D. Distribution of cell types of pars distalis and pars intermedia: half shaded circles (basophils 1 (B1), AF positive) and crossed circles (basophils 2 (B2), AF positive). E. Distribution of cell types in pars distalis: half shaded circles (basophils 1 (B1), PAS positive) and crossed circles (basophils 2 (B2), PAS positive). Fig. 2. Camera lucida diagram of mid-sagittal section of the pituitary gland C.versicolor to show the distribution of cell types of pars distalis and pars intermedia during non breeding season X 100. A. Mid-sagittal section of the pituitary gland of C.versicolor showing various parts. B. Distribution of cell types in pars distalis (open circles, acidophils 1(A1), erythrosine positive) and pars intermedia (closed circles, acidophils 2(A2), orange G positive). C. Distribution of cell types in pars distalis: Anterior to posterior i.e., half shaded circles (basophils 1 (B1), aniline blue positive) and crossed circles (basophils 2 (B2), aniline blue positive). D. Distribution of cell types of pars distalis and pars intermedia: half shaded circles (basophils 1 (B1), AF positive) and crossed circles (basophils 2 (B2), AF positive). E. Distribution of cell types in pars distalis: half shaded circles (basophils 1 (B1), PAS positive) and crossed circles (basophils 2 (B2), PAS positive). pars distalis; BV- blood vessels; ME- Median eminence; PI- Pars intermedia. The pituitary gland of C. versicolor is a compact mass and its lobes are completely covered with Sella turcica of sphenoid bone, and it is attached to hypothalamus by a delicate stalk. It is composed of two basic units neurohypophysis and adenohypophysis. The adenohypophysis includes pars distalis (PD), and pars intermedia (PI). The pars tuberalis which is usually reduced in reptiles, is absent in C. versicolor. a) Pars distalis (Figs. 4-11). The pars distalis is separated anteriorly from the infundibular floor and median eminence by a cleft filled with connective tissue. The cleft is reduced in size. Posterior dorsal inflection of pars distalis meets the pars intermedia. Anterior pars distalis surrounds a part of upper portion of neurohypophysis and posterior pars distalis surrounds the lower part of neurohypophysis and also anterior region of pars intermedia. The portal vessels run across the cleft embedded only in connective tissue. The pars distalis is clearly divided into anterior and posterior lobes by a slight constriction. Somatotropes; B1 ­Tyrotrophs; B2- Gonadotrophs; APD- anterior pars distalis; PPD- Posterior pars distalis. b) Pars intermedia (Figs. 13-15). The pars intermedia surround the posterior region of neural lobe more or less completely as an enclosing cup. It is thick with many cellular layers making a massive glandular structure more or less equal to that of pars distalis in size. c) Neural lobe (Fig. 16). The neural lobe is carried on the end of the infundibular stem which is long with finger like projections which extend in the pars intermedia. The neural lobe is not solid, the hallow portion extends even into the adenohypophysis. The wall of neurohypophysis is 3-4 cell layers thick. In many places it is reduced to 1-2 cell layer thick. d) Median eminence (Fig. 3). The median eminence is situated anterior to neurohypophysis with a few pituicytes. Histophysiology of pituitary gland of C. versicolor. a) Pars distalis (Figs. 4-11). The pars distalis is the major portion of the pituitary, which shows variation in the staining property. The different cell types are identified depending on the staining property of the cell. The anterior pars distalis is rich in acidophils than the posterior pars distalis during breeding season. These cells are differentiated as A1 cells and A2 cells. The A1cells are erythrosinophilic and stained purple or red by Cleveland Wolfe's trichrome staining techniques (Fig. 2). The A2 cells are stained with orange G (organgeophilic) by the trichrome techniques (Fig. 3). A1 cells are usually present in groups of acinus type. A1 cells are oval, round or elongated with an excentric nucleus. These cells are numerous during breeding season and dispersed in groups like cellular is lets amongst erythrosinophilic (A1) cells. These islets are concentrated at the cephalic region of anterior pars distalis. The pars distalis cells also take aniline blue stain with trichrome. These cells are classified as B1 and B2 cells and are slightly larger. They are distributed throughout the pars distalis. During breeding season they are more secretory and granular (Figs. 4 and 5). These cells are also AF positive and during breeding season they are deeply stained (Fig. 6). Their secretion in the form of granules is collected in the small sinusoids (Fig. 7). During nonbreeding season these cells are faintly stained (Fig. 8) and there is a little or no secretary materials in the sinusoids (Fig. 9). There are a few small cells which are unidentified may be termed as B3 cells in the pars intermedia (not shown). Figs. 8-11. 8. Pars distalis of breeding season showing AF positive at anterior portion. Gonadotrophs are highly secretory X 250. 9. Inset of fig.6 showing gonadotrophs showing large number of AF positive granules X 400. 10. Pars distalis of nonbreeding season showing AF negative gonadotrophs X 250. 11. Inset of fig.8 showing gonadotrophs devoid of secretory materials X 400. B2- Gonadotrophs; APD- anterior pars distalis. Figs. 12-15. 12. Portion of the pars intermedia showing AF positive melanotrophs during breeding season. X 400. 13. Portion of the pars intermedia showing erythrosine positive melanotrophs during breeding season stained with Cleveland Wolf's trichrome X400. 14. Portion of the pars intermedia showing weak AF positive melanotrophs during nonbreeding season stained with AF -Fast green- chromotropes 2R X 400. 15. Parts of pars intermedia showing poor erythrosine positive melanotrophs during nonbreeding season stained with Cleveland Wolf's trichrome X400. 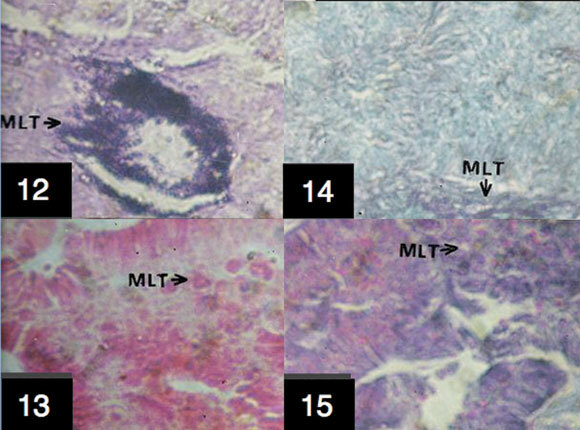 MLT-Melanotrophs. b) Pars intermedia (Figs. 13-15). The pars intermedia is large and lobulated with neural plexus penetrating with capillaries. The pars intermedia cells are arranged in cords. They are AF positive and also take deep stain with erythrosine during breeding season. The cell secretion migrates towards the anterior end of the cell and collected at the central place of the cord (Fig. 12 and 13). During nonbreeding season they are AF negative and less secretory (Fig. 14). When stained with trichrome they become erythrosine negative as they are less secretory (Fig. 15). c) Neural lobe (Fig. 16). Neurosecretory material of neural lobe is AF positive neural lobe take deep blue stain because of its storage of secretory material present in the form of thick granules. These neural cells are arranged 3-4 cells thick layers on the walls on neural lobe. Highly secretory neurosecretory material is seen during both breeding and nonbreeding season. Fig. 16. Portion of neurohypophysis showing thick AF positive neurosecretory granules during both the season stained with AF-Fast green- chromotropes 2R X 400. NSG- Neurosecretory granules. Figs. 12-15. 12. Portion of the pars intermedia showing AF positive melanotrophs during breeding season. X 400. 13.
positive melanotrophs during nonbreeding season stained with Cleveland Wolf’s trichrome X400. MLT-Melanotrophs. green- chromotropes 2R X 400. 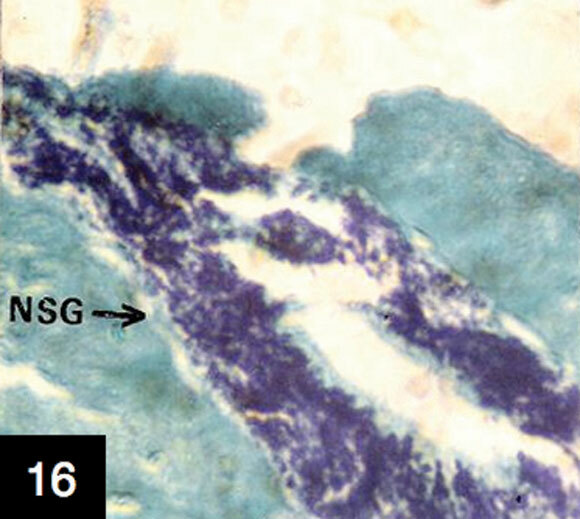 NSG- Neurosecretory granules. Anatomy of pituitary gland of C. versicolor. Unlike other classes of vertebrates, the studies on the anatomy as well as cytology of reptilian pituitary are sparse and sporadic. However, the pituitary gland of reptile is composed of two basic units adenohypophysis and neurohypophysis. The adenohypophysis is divided into pars distalis (PD), pars intermedia (PI) and pars tuberalis (PT). Ramaswami (1980) has described pituitary gland of some Indian reptilian species in relation to neurosecretion and angioarchitecture. The partition of pars distalis into anterior (cephalic) and posterior (caudal) lobes has been described in several Indian lizards, Psammophilus blanfordanus, Hemidactylus flavivihdis, Mabuya carinata, Chainleon zeylanicus and Varanus flavescens (Mohanty & Naik, 1984). The pars intermedia lies posterior to the solid pars nervosa in the sea snakes and covered largely by pars distalis. A nonglandular pas tuberalis containing portal veins which pass into the pars distalis in Varanus, Uromastix, Erys and Ptyas is reported by Jacob (1965) and Ramaswami. However, in the present study it is very clear that the pars tuberalis is totally absent in Indian garden lizard Calotes versicolor. In primitive reptiles like sphenodon, the pars tuberalis is attached to the ventral surface of the median eminence on one side and other side to the anterior pars distalis. In crocodiles it is attached to the median eminence as a thin paired juxta neural plate, with a portal zone joining to the pars distalis. In lacertilia, the pars tuberalis develops in the embryo as typical lateral lobes of the hollow Rathke's pouch, which grows forward and contacts the median eminence and pars distalis. In most of the adults pars tuberalis is separated into two structures, the juxta neural tuberalis plates on the floor of the infudibulum and the pars tuberalis interna, on the cephalic pars distalis. They usually undergo remarkable changes in the adult, the tuberalis cells invading into the hypothalamic and median eminence tissues to a greater or lesser degree (Saint Girones, 1970; Holmes & Ball). The absence of pars tuberalis in C. versicolor may be due to the same reason. The pars distalis which is an important part of pituitary in all the reptiles occupies major portion which links anteriorly with pars tuberalis and posteriorly with pars intermedia. In C. versicolor as pars tuberalis is absent it is linked anteriorly to the infundibular floor and median eminence by a cleft filled with connective tissue and posteriorly it meets the pars intermedia. Anterior pars distalis surrounds a part of upper portion of neurohypophysis and posterior pars distalis surrounds the lower part of neurohypophysis and also anterior region of pars intermedia. The pars intermedia which usually surrounds the neural lobe, varies greatly in size being only one or a few cell layers in some lizards, eg. Lacerta, Anguis and Xantusia, but it forms a thick glandular structure in Varanus, Agama and Chameleon (Wingstrand). This is completely atrophied in blind burrowing lizards, Amphisbaenids and Trogonophids. The pars intermedia is particularly large in iguanids, such as Anolis, have marked capacity for adaptive colour change controlled by MSH. Nonhouayi-Besnard (1966) has reported the large cleft sending diverticuli into the caudal pars distalis, as well as into the pars intermedia in Varanus niloticus. It is observed in the present study that the pars intermedia of C. versicolor is large and glandular during breeding season which may be due to the fact that MSH secreting cells are more active during this period as C. versicolor is characterized by crimson red color at the cephalic region specially in males. The neurohypophysis or neural lobe is the end of an infundibular stem varies in thickness depending on the species. The neural lobe is never solid; however large but always contains at least short extension of the infundibular recess (Holmes & Ball). In C. versicolor the neural lobe extends from the infundibular stalk as a compartment in between pars distalis and pars intermedia and extends finger like projections into pars intermedia. It is 2-3 cell layers thick in many places, but the upper part is thickened with 4-6 cell layers. Median eminence is present anterior to the neurohypophysis and with pituicytes. In C. versicolor it is filled with extensive portal capillaries. Hypothalamo-hypophyseal interrelationship. Morphological, experimental and seasonal studies on the pituitary gland as well as on the hypothalamo hypophyseal complex in reptiles are much fewer compared to other vertebrates. In reptiles there is a little evidence available regarding hypothalmic control of pituitary function (Callard & Willard, 1969; Meurling & Willstedt, 1970). However, the presences of median eminence and well defined hypothalrmo-hypophyseal portal system regulating the activity of pituitary gland have been described in reptilian species (Green, 1951; Wingstrand; Hasegawa, 1960, 1969). The preopic nuclei of the hypothalamus is divided into supraoptic nuclei (SON) and para ventricular nuclei (PON), AF positive fibres orginating from these centres terminate into median eminence and neural lobe. In H. flaviviridis the neurosecretory axon of SON and PON unite to form a common tract anterior to median eminence is reported to be almost completely isolated bed of neural lobe. The capillary plexus of neural lobe are reported to give rise to bundles of capillaries which supply to pars intermedia (Sheela & Pandalai, 1965/1966). The releasing hormone drained from the median eminence into pars distalis. Portal vessels are largely known to be responsible for controlling adenohypophyseal function. In all probability the blood entering the neural lobe from the median eminence might also be exposed to releasing hormones. These principles might reach the blood vessels of the vascular septum separating the neural lobe and pars intermedia and might be responsible for controlling the pars intermedia. Histophysiology of the pars distalis. Histophysiology of the reptilian pars distalis have been reviewed by a few investigators (Saint Girons, 1970; Eyeson). Licht & Pearson (1969a, 1969b) have described various cell types in the pars distalis of Anolis carolinensis. In general, the reptilian pars distalis as usual in tetrapods consists of irregular branching cords of endocrine cells generally with two cells thick, interspersed with capillary vessels. In chelonians the cells are often arranged in pseudo-acini (Saint Girons, 1970), sometimes containing colloid material resulting in a thyroid like structure of the entire pars distalis (Wingstrand). In C. versicolor as seen in the present study pars distalis is consisting the cells arranged in pseudo-acini with plenty of capillary vessels during breeding season. 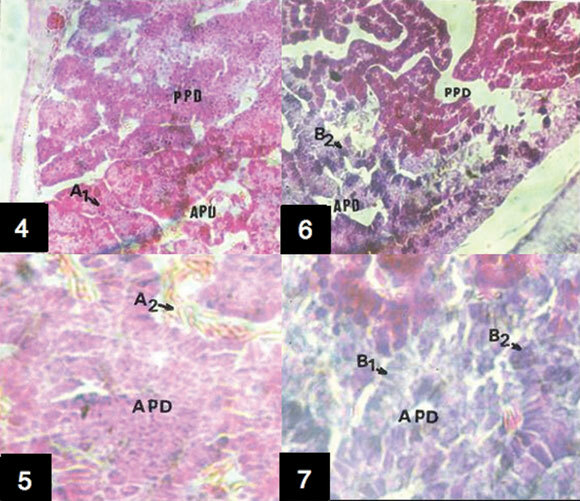 Like other reptiles the following five chromophilic cell types could be identified in the pars distalis depending on their staining property and size. Acidophils type 1 (A1). A1 cells have been described in many reptilian species. They are located mainly along the capillaries in the cephalic lobe. They may be numerous or scarce, well granulated or sparsely granulated, depending on species and physiological state. In Sphenodon and some Lacertids, they tend to be organized in pseudo-follicles (Saint Girons, 1970). Electron microscopic study shows the variation in the granular cell size, and the degree o1 carminophilia (Wingstrand; Licht & Nicoll; Eyeson). A1 cells are erythrosinophilic and are totally PAS negative and also AF negative (Saint Girons, 1967a, 1967b). In C.versicolor A1 cells are erythrosinophilic stained red or purple by Cleveland - Wolfe's trichrome technique and negative to PAS and AF as reported in Anolis. By bioassay of cephalic and caudal fragments of pituitary of a turtle (Pseudemys), lizard (Anolis) and snake (Thamnophis) it is identified the A1 cells as lactotropes (Licht & Rosenberg, 1969; Sage & Bern, 1972) Therefore, the identified A1 cells of C. versicolor may be regarded as Lactotropes. Acidophils type 2 (A2). The A2 cells are often large cells in Agama and Viper and present at the caudal pars distalis (Eyeson, 1970; Saint-Girons, 1967a,b) and very small in lacertids and snakes (Saint Girons, 1967a, 1967b). In C.
versicolor A2 cells are small like those of lacertids and present in groups, unlike the cords of A1 cells. As described by Eyeson in Agama these cells and orange G + and such cells are confirmed as somatotropes by disc electrophorsis and by bioassay in turtle (Licht & Nicoll). These cells are less tends towards chromophilic during nonbreeding season. The A2 cells tend to enlarge and slightly degranulate during early stage of vitellogenesis and sexual activity in female Agama (Eyeson). These cells tend to reduce in number and become chromophobic during nonbreeding season in C. versicolor. Basophils type 1 (B1). These cells are usually large in some lizards and snakes, spherical in Agama and elongated in many other snakes (Saint Girons, 1967a, 1967b; Eyeson). They are scattered throughout the pars distalis. In C. versicolor these cells are small and are strongly PAS positive, AF positive and aniline blue positive B1 cells can be differentiated from B2 cells which have the same staining properties by their size and dispersment. These cells are identified as thyrotrophs by thyrodictomy in Agama (Eyeson). During nonbreeding season they become closer to B2 cells. Basophils type 2 (B2). These cells are generally scattered evenly throughout the pars distalis in many reptiles (Anolis and Sphenodon) and concentrated mid ventrally in most snakes and lizards (Iguanidae and Varanidae) and concentrated in the cephalic lobe in Agamidae. In C. versicolor they are present throughout the pars distalis in cords. The individual cell is larges cubiodal to columnar. The secretory granules are typical basophilic and PAS positive, AF positive and aniline blue positive. These cells are universally accepted as gonadotrophs. The B2 cells are large and more active during breeding and loaded with secretory material. Soon after the breeding the cells become PAS negative, AF negative and aniline blue as they become degranulated and marked with vacuolization with large rounded nuclei. Unlike in mammals it seems that reptilian pituitary secretes only one gonadotrophin with both FSH and LH properties. Basophils types 3(B3). In many reptilian species PAS positive and AF positive cells have been identified as B3 cells and identified as adenocorticotrophs (ACTH). As the present study has been undertaken by the help of light microscope only, it is not possible to identify these cells and their secretory nature. However, electro microscopic study may help for identifying these cells. Histophysiology of the pars intermedia. The pars intermedia is massive with the cells arranged in regular cords in C. versicolor. The similar type of massive pars intermedia is found in crocodilians, chelonians and most snakes. At the other extreme the pars intermedia is reduced or totally absent in borrowing snakes and lizards (Saint Girons, 1970). The pars intermedia is lobulated because of presence of neural lobe in C. versicolor, the situation which is similar in Anolis & Varanus (Wingstand; Rodriguez & La pointe, 1970). The intermedia is large in lizards capable of rapid colour change eg. Anolis, Chameleons, Calotes, Agamids in general and diurnal geckos, but it is also large in some lizards which do not change colour (eg. Acanthodacytlus, nocturnal geckos). Therefore it is not clear whether size of pars intermedia is related to the power of adaptive integumentary color change. In chameleon the rapid colour changes are entirely under nervous control, MSH seemingly playing no role (Hadley & Goldman, 1969; Nayar & Pandalai). In C. versicolor the pars intermedia cells are AF positive and erythrosine positive, highly granulated during breeding season and gradually become degranulated during nonbreeding season. This secretion (MSH) which is the main controlling factor of melanophores may be helping to display crimson orange color during breeding season. It is of interest to note regarding the hypothalamic control of MSH secretion. So far, only one positive evidence is available on Kalubernia. Transection of the infundibulum caused degranulation of secretory cells suggesting the role of hypothalamus in MSH secretion (Rodriguez, 1971). Histophysiology of the neural lobe. The neural lobe is generally packed with neurosecretory materials in reptiles and Diadophis punctutus. It is reduced in response to dehydration and increased after injection of pitocin (Philibert & Kamemoto, 1965). The neural lobe is thin walled and occurs as a outpocketing of the infundibular reces, surrounded by pars intermedia in Sphenodon, Varanus and Chameleon. The neural lobe is AF positive and the axon contains thick AF positive granules. It is difficult to note the difference between the secretory pattern of these cells, during breeding and nonbreeding season as it contains thick neurosecretory secretion during both the seasons. In Sphenodon the neural lobe contains three layers. The ependymal cell display basal processes which cross the neural lobe to end on the walls of the plexus intermedius. The fibrous layer contains AF positive pictuicytes are rare and appear to be simply ependymal cells which have sunk into the neural tissue (Rodriguez & La pointe, 1969), but this type of study is still lacking in Indian garden lizard C. versicolor.